For Christmas this year, my first year living completely away from home, my mom decided that a Singer sewing machine was a better gift than a TV, winter boots, place-mats, etc. Granted, it was a fantastic gift and I’ll have it forever – thanks Mom! I know she bought it in the hopes that I would become more productive. Her favorite saying (used most appropriately while shopping) is, “You know, you could make that”. Pinterest is her new favorite website, my bedroom is her new favorite craft room, and endless afternoons have been spent in beading or stamping stores. End result: Artist markets no longer impress me. Being the offspring of such an artistic individual perhaps turned me into a practical adult. Which is why, after finishing the latest season of Downton Abbey, I decided to take on the project of sewing up a few of the Crawley women’s dresses – simple, right? Well, I got to the fabric store, picked out some beautiful silks and taffetas…and ended up making curtains instead. 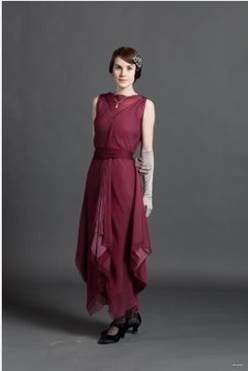 So, during a recent trip to H&M, I was delighted to find 1920’s–esque dresses mysteriously similar in style to those of my favorite TV show. Get excited ladies, a new fashion trend? !